(BPT) - For homeowners looking to improve the value of their homes – and cope with the needs of multiple generations living under one roof – basement and garage renovations make sense. Both can enhance home value and add much-needed living space for less than one might spend on building an addition. Basement and garage projects recoup 66.8 percent and 57.2 percent of their original costs, respectively, at the time of resale, according to Remodeling Magazine’s Cost vs. Value Report. And millions of American households now consist of multiple generations living under one roof, U.S. Census Bureau statistics show. Before you dive into one of these worthwhile renovation projects, you should consider an often-overlooked logistic of working in a basement or garage – the concrete floor beneath the structure. Often, converting a basement or garage into usable living space involves adding plumbing for a bathroom or kitchenette. Usually, that means cutting into the concrete to install pipes, drains and storage tanks. * Cutting through concrete undermines the structural integrity of the slab, no matter how carefully the cut is made or patched. If the contractor fails to use the same or a better grade of concrete, the patched section will be weaker than the rest of the slab. * Conditions are unpredictable. Plumbers won’t always know the depth of the concrete, whether rebar or tension cables are incorporated in it or what surface – sand, rocks or a ledge – is beneath it. Cutting into internal structures meant to strengthen the slab can further weaken it. * No matter how careful a cut a contractor makes, edges can crack or crumble, and once a crack begins, it can extend across the entire slab, and even affect the footing or walls of the room. * Once a stress crack evolves, it can allow radon and groundwater to seep in. Extended wet weather – the kind you get in the spring in many parts of the country – could be enough to allow water to leak into the structure. 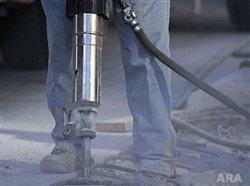 * Breaking through concrete generates dust and noise – a lot of both. While the noise will stop once the cut is completed, the dust can linger much longer. Concrete dust is not like regular household dust; it’s thicker and particulate and can get into everything, including your heating, ventilation and cooling system. Finally, the factor that can be the biggest issue of all for homeowners trying to keep a project on budget: cutting concrete can be very costly. So what’s the solution if you must add a bathroom or kitchen to your basement or garage renovation? “Above-floor plumbing is a more cost-effective, time-friendly alternative to cutting through concrete and installing traditional below-floor plumbing,” Peterson points out. Macerating – or up-flush – plumbing systems don’t require installers to cut through concrete or dig. The system can be installed right on top of the existing floor. Waste and water from a toilet, tub or sink is pumped through small-diameter piping, rather than flowing down like conventional plumbing. The up-flush system doesn’t store waste like a sewage ejector system; waste and water move to the septic or sewer system with every flush. Log on to www.saniflo.com to learn more about above-floor macerating systems.